A lack of regulation of online pharmacies is putting people at risk from fake medicines, research suggests. Analysis of more than 3,000 sites found medicines for sale without a prescription and some that were likely to be counterfeit or out of date. Industry fraud advisers MarkMonitor also found half of the sites did not safeguard customer details. The Royal Pharmaceutical Society is planning to roll out a logo scheme to help consumers identify genuine sites. But experts warned against buying medicines online. Sales of six popular prescription drugs for problems such as weight loss and erectile dysfunction were monitored in June for the survey. Of 3,160 pharmacies found to be selling one or more of the drugs, only four had a Verified Internet Pharmacy Practice Site accreditation (a scheme set up by US pharmacy boards) although many others falsely claimed they had. More than half did not secure customer data. And extremely low prices suggested some of the drugs sold were likely to be fake, expired, stolen, diluted - or a different medicine to that promoted on their label. A 10th of the sites advertised the fact that no prescription was required to buy medicines. Each of the sites had an average of 32,000 visitors daily, which could equate to £2bn in annual sales for the six drugs looked at. Charlie Abrahams, from MarkMonitor, said they did not realise the scale of the problem before they did the analysis. "The things that jumped out were very few were accredited, half of them had no security and they're selling at about a fifth of the retail price which suggests they're counterfeit. "We found some sites claiming to be Canadian but in fact they were Russian." He said people were putting their health in danger by buying medicines online. The Medicines and Healthcare products Regulatory Agency (MHRA), a watchdog which oversees the quality of medicines available in the UK, can only close down British-based sites which break the law, because it has does not have jurisdiction over those based abroad. 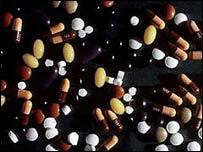 The agency said they would advise consumers not to buy medicines on the internet. "At any one time the MHRA are investigating around 100 cases where they believe there have been breaches of the Medicines Act relating to the illegal sale or supply of medicines via the internet," a spokesperson said. All pharmacies based in Great Britain, including those providing internet services, must register with the Royal Pharmaceutical Society. The society agreed there were a number of websites offering to sell medicines from suppliers who have no professional qualifications or healthcare expertise. They are planning to roll out the logo scheme at the end of 2007, which provides a direct link to the society's website where visitors can verify the registration details of both the pharmacy and pharmacist. "Patients considering purchasing medicines via the internet should be encouraged to verify the website is operated from a registered retail pharmacy. "This is to ensure their medicines are obtained from a reputable source and accurate and appropriate advice in relation to their medicines is received." Should there be a ban on buying medicines online?